An affidavit of service is prima facie evidence that process was properly served. Reem Contracting v. Altschul & Altschul, 117 A.D.3d 583, 584 (1st Dept. 2014). Absent affidavits from a defendant that he was improperly served, personal jurisdiction will stand. EBC Amro Asset Management Ltd. v. Kaiser, 256 A.D.2d 161, 162 (1st Dept. 1998). 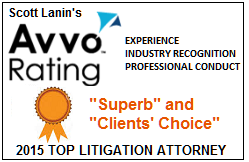 http://westdeerems.com/team_member/carin-frank/ visit here If you have any legal questions or need help with service of process and jurisdiction, please contact Attorney Scott Lanin at (212) 764-7250 x 201 or use the contact form in the right sidebar.